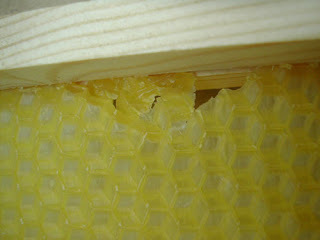 > The Hive DIY Tip- how to avoid damaging foundation during frame making. If you are anything like me I despair when I slightly tear a perfectly good piece of foundation while making up brood frames. Once you tear or badly distort the foundation your bees will avoid this area when drawing out the cells. This will result in either holes or distorted areas on the finished face of the comb. These holes in time can hide queen cells or the queen and will in a short time need to be replaced. 1) When nailing together your frames don’t line up the bottom bars exactly to the outer edge of the side bars. Leave a slight gap, resulting in making the inner dimensions of the frame slightly wider. This will allow your wax foundation sheets to slide more easily within the grooves of the side bars when fitting. 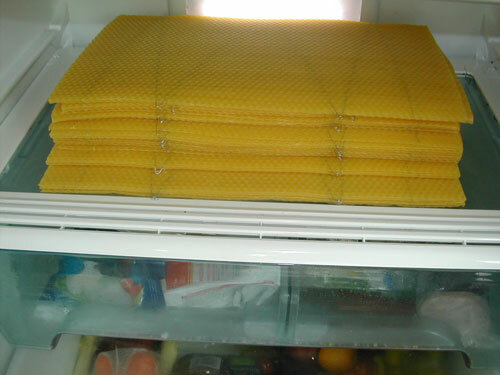 2) Put your foundation sheets in the fridge prior to fitting them in the frames. This will make the wax sheets more rigid and they will slide/handle more easily when fitting them in the frames. Avoid a warm room as your wax foundation will sag and rip more easily when handling each wax sheet. Hope that helps- let me know if it works for you or any DIY tips you found useful!